Receiving a constant stream of gushing calls has become de rigour of his life and female adulation has become a part of his life now.Rajeev Khandelwal is certainly ruling the television and has become the new teenage sensation of the small screen.Rajeev Khandelwal seems to be born to play the character of Sujal in Kahin To Hoga! At least his fans think so.Then came Varun in Time Bomb. After building Varun's character in his just finished serial Time Bomb, this good-looker from Delhi, has proved that he is here to stay for sure.With feet firmly planted on the ground, Rajeev treads the path of stardom knowing he has to constantly prove himself. 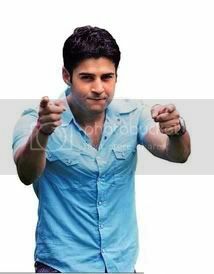 Lets enjoy by discussing about our favourite television super star, Rajeev Khandelwal. Rajeev Khandelwal Spreading A Virus!